Dundee West MP Chris Law has called for Myanmar State Counsellor Aung San Suu Kyi to be stripped of the freedom of the City of Dundee, following her personal role in the denial of visas to members of the International Development Committee due to travel to the country. Mr. Law, the SNP’s Spokesperson for International Development, was to visit Myanmar as part of the Committee’s inquiry into the Department of International Development spending in South-East Asia. Planned meetings with Government and military officials in Myanmar, including Aung San Suu Kyi herself, have had to be cancelled. It has been claimed by Committee Chair Stephen Twigg MP that Suu Kyi had a personal hand in the blocking of visas. Giving a speech in Parliament announcing my intention to write to Dundee City Council over her Freedom of the City. The Committee were also set to visit Rakhine Province and the Magway Region, areas who benefit from over £100 million in DFID spending in Myanmar, but also the scenes of suspected human rights abuses against the local Rohingya Muslim population. Aung San Suu Kyi has been State Counsellor, similar to a Prime Minister, of Myanmar since 2016. She spent 15 years under house arrest following a military takeover and received the Nobel Peace Prize in 1991. She was awarded Freedom of the City of Dundee in 2008, however numerous other cities have since rescinded the award since the beginning of the Rohingya Muslim Crisis in August 2017, including Glasgow, Oxford and Dublin. Mr. Law said: “It is my belief that this is a purely political decision by the Embassy of Myanmar and Aung San Suu Kyi to protect her Government from what we would uncover in the region. As someone who previously deeply respected her, this is particularly disappointing. 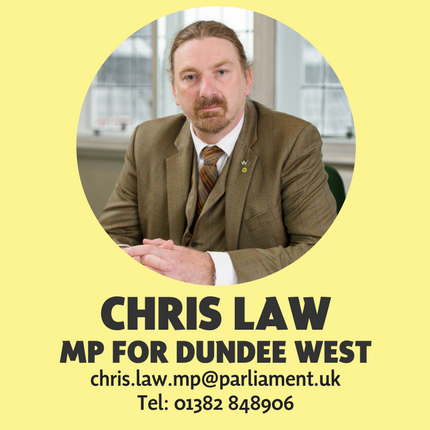 I am writing to you in my capacity as SNP Spokesperson for International Development & Climate Justice, Member of the International Development Committee (IDC) and MP for Dundee West. I understand that Dundee City Council wrote to the Burmese government last year to seek assurances regarding Aung San Suu Kyi’s position on the fate of the Rohingya Muslims. If no assurances were received, the council were to decide whether to remove the Freedom of the City, given to Aung San Suu Kyi in 2008. There are now over 700,000 Rohingya in refugee camps in Bangladesh – around 400,000 of them children – who have fled persecution in Burma. I have spoken on this issue many times in the UK Parliament and publicly in Dundee City over the last few months. During this time I was still in hope that Ms Suu Kyi would speak out in support of the Rohingya people and against the atrocities happening in her country. However, a visit by the IDC to Burma this week, which had been planned for months, was cancelled last minute due to the refusal by the Burmese authorities to issue visas for the trip, despite all diplomatic efforts to reverse the decision, including a personal letter from the House of Commons Speaker to the Burmese ambassador. The Burmese authorities claim the reasons for this was because of a public holiday in the area at this time; and therefore security issues around the trip and the protection of the visitors. However, the Chair of the IDC, Stephen Twigg MP, told the House of Commons yesterday that it was Aung San Suu Kyi who blocked the approval of the visas, and he believes this is a direct retaliation to the Committees report and a clear attempt to silence any opposition to the treatment of the Rohingya. The Department for International Development (DFID) has a substantial aid programme in Burma, and as part of the Committee’s essential remit to scrutinise DFID spending, the planned visits to Sittwe in Rakhine Province and Pakokku in the Magway Region would have allowed the Committee first hand access to these projects. Aung San Suu Kyi was well-known voice for human rights and a long time campaigner for democracy in Burma, but has now completely failed to stand up for the Rohingya in her country. It is my view that our city should not honour those who stand by and do not speak up against such atrocities. I am therefore writing to request that you now seriously consider withdrawing the honour of the Freedom of the City from Aung Saan Suu Kyi. It is clear now that the reasons the honour was awarded are no longer being upheld. I am happy to give you updates from the second part of the trip to Bangladesh which is still going ahead, where I will hear first-hand accounts from Rohingya refugees. I look forward to hearing your decision.